I am thrilled to be teaching a class I could have only dreamed of teaching a few years ago. I have been blessed to be able to teach a class on the great American Civil War because of my school, Trinity Midland, has opted to allow students to choose history electives. The students are required to take a core history class and then are allowed to take two electives (or more) and one of those classes is my Civil War Class. Mr. Pat Wasson was instrumental in getting this done, thank you! I have been fascinated with this event for as long as I can remember studying history. I think the war is the seminal event in our history. As I write this we have severe issues with racism and sexism. I would argue one cannot understand our the issues with race today without understanding the Civil War. Click To TweetThe causes of the war run deep to be sure, but at the core of the issue is the issue of slavery. American slavery was unique in that we chose to enslave people based on race. Throughout history, slavery was based on issues other than race, or race was not the main criterion to enslave one. But America’s great sin is the sin of slavery. This history of slavery has not been forgotten, indeed, it has exacerbated our issues as we piled on our sin of slavery with the sin of systemic racism in the form of Black Codes and Jim Crow laws. For over one hundred years we denied basic civil rights to a group of people we had previously enslaved. A great sin indeed. But we cannot forget that so many went to war to erase that great sin, yes, the war was fought over slavery. One can argue that we went to war to reunite the union and the South left over the issue of state’s rights, but at the heart of the issue was slavery. Would the South have seceded had slavery not been THE issue of state’s rights? As we argue over the issues today let us not forget that over 620,000 died in this war, the majority dying to reunite this country and to free those slaves, white and black men alike. This is the lesson I want to instill in my students: America is not a perfect place, but we have and are acting to make it a better place. To understand America and her people is to understand the Civil War. The text I have chosen for the course uses the same format. The book is entitled, The Civil War: A Concise History. It is highly readable. 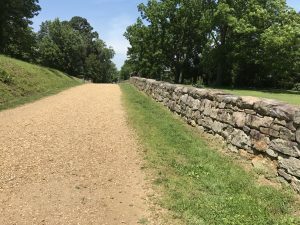 I took a trip of a lifetime this summer as I traveled the East and visited seven battlefields. I was treated so well by our parks service and they took the time to teach me everything they knew, many thanks. Here is a link to that trip. I have created a webpage for my students and invite you to visit it as we travel through the Civil War. I would love to hear your thoughts, until next time, peace.